A powerful, flexible jam and practice rig. Professional drummers, bassists, and guitarists with countless platinum albums to their credit have filled the Line 6 Spider Jam with over 100 pulse-racing Endless Jam tracks and drum grooves. Exploding out of the Line 6 amp's 12" Celestion speaker and 2" tweeter in vivid, uncompressed audio, these tunes were recorded at legendary studios around the word ensuring the best possible sound quality. Plus, the Line 6 Endless Jam Engine keeps all the jams sounding fresh, keeping guitarists engaged for fun days of engaging practice. Ideal for songwriting and recording, Line 6 Spider Jam captures jams, solos, and song ideas, internally storing up to 100 CD-quality recorded jams, with over 24 minutes of recording time. Line 6 Spider Jam is capable of supporting more than a single instrument, or an instrument and a microphone. The 75W Line 6 amp offers an XLR mic input with a dedicated volume knob perfect for vocals, and a 1/4" aux input perfect for a second instrument like a keyboard or bass. These 2 inputs share a dedicated set of effects plus preamps, compressors, and a 3-band EQ. Spider Jam also boasts a 1/4" headphone out that doubles as a POD 2.0-style direct out for effortless, hassle-free direct recording. As a member of the famous Line 6 Spider III family of guitar amplifiers, Spider Jam shares some popular family jewels like 200+ artist-created presets, 150+ song-based presets, 12 original Line 6 amp models, from Clean to Insane, and 7 stunning Smart Control FX, including reverb, delay and more. The Spider Jam's 12" Custom Celestion speaker ensures brilliant guitar tones and an integrated accurate chromatic tuner is always at the ready. Red LED: Crisp, shimmering clean tones and warm jazz tones. Green LED: Glassy clean tones like those from the late 60s/early 70s. Inspired by a '73 Hiwatt Custom 100. Red LED: Classic, glassy high-end with some snap and bite. Inspired by a Fender blackface '65 Twin Reverb and a blackface '64 Deluxe Reverb. Green LED: Swingin' rockabilly tone a la vintage tweed. Inspired by a '53 Fender tweed Deluxe Reverb, a '58 Fender tweed Bassman, and a '60 Gibson Explorer. Red LED: From gritty, swampy clean tones to syrupy smooth drive tones this was inspired by a mix of a '65 Marshall JTM-45, a '58 Fender Bassman, a '63 Fender Vibroverb, and a Supro. Green LED: Early British rock tone made famous by the Beatles and the Stones. Inspired by a fawn Vox AC-30 with an updated and expanded tone control circuit. Red LED: Classic crunchy tone popularized by many early metal bands. Inspired by a '68 Marshall Plexi 50-watt. Green LED: The infamous brown sound inspired by a '68 Marshall Plexi 100-watt with a few added extras - jumped input channels and a Variac transformer. Red LED: Tight and punchy high-gain sound inspired by a Mesa/Boogie Dual Rectifier. Green LED: Use this for aggressive high-gain sound. The mid knob sweeps the tone spectrum. Set to minimum for fuzz-pedal characteristics, set to noon for creamy, modern high-gain, or crank it for Class A carnage. Red LED: Famed and feared bone-crushing, brain-piercing grind inspired by the Mesa/Boogie Dual Rectifier red channel. Green LED: Short of a complete meltdown, this provides as much input-gain distortion as possible while retaining tonal definition and character. All product names used in this web page are trademarks of their respective owners, which are in no way associated or affiliated with Line 6. 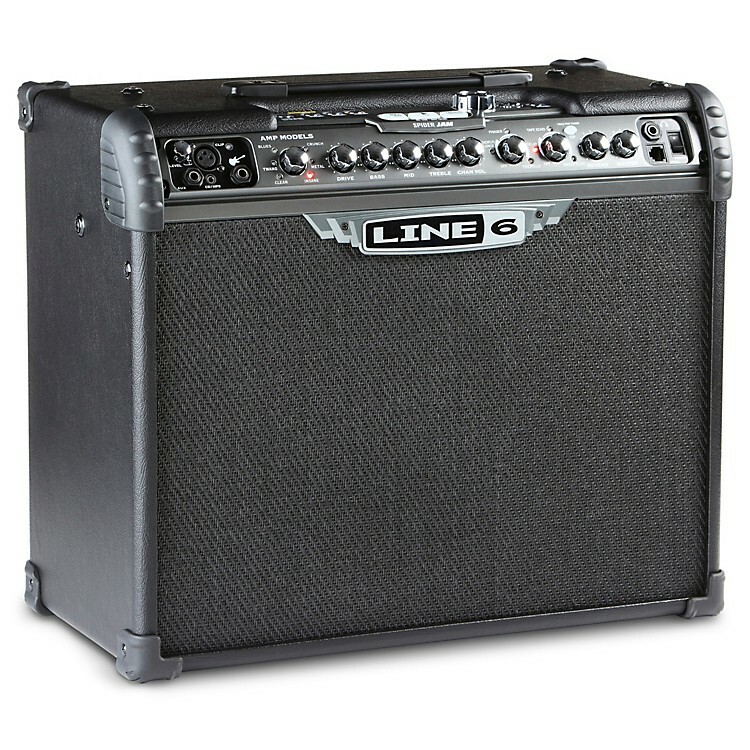 These trademarks of other manufacturers are used solely to identify the products of those manufacturers whose tones and sounds were studied during Line 6's sound model development. Hiwatt is a registered trademark of Fernandes Company Ltd. Fender, Bassman, Deluxe Reverb, Twin Reverb are registered trademarks of Fender Musical Instruments Corporation. Gibson and Explorer are registered trademarks of Gibson Guitar Corp. Supro is a registered trademark of Zinky Electronics. Vox is a registered trademark of Vox R&D Limited. Marshall is a registered trademark of Marshall Amplification Plc. Mesa/Boogie and Rectifier are registered trademarks of Mesa/Boogie Ltd.
Line 6 shoe-horned an entire band into the Spider. Are you ready to jam?